Machines are now programmed to think and behave like us, and carry out some heavy duty chores, only faster and far less error prone than us.Robotic Process Automation is implemented predominantly everywhere, enforcing gargantuan tasks with implausible compliance and speed, making room for flush and flourishing global economy, without affecting the underlying systems.Since we are already talking about automation, let’s talk about the most trending enterprise/ tool of this industry, Automation Anywhere. Automation Anywhere is applicable to enterprises looking to deploy a digital workforce composed of software bots that complete business processes end-to-end, combining traditional RPA with cognitive intelligence(reading unstructured data, natural language processing).It can be applied to all kinds of business processes, including legacy applications and applications exposed over Citrix. The interface of Automation Anywhere offers you primary features to record, modify, and tasks extending anywhere between simple and complex. Automation anywhere allows you to create automated tasks with ease, applicable to a wide range of situations, without re-engineering any process. Clearly, Automation Anywhere is the complete business process automation solution available today! 4. Logging into websites, searching websites, submitting web forms, or updating records on a website. 5. Managing ERP front-end processes, including SAP, Oracle Applications, PeopleSoft, MS Dynamics, Salesforce, and more. 6. Automating data transfers, including importing/exporting data between applications or files. 7. Use the Automation Anywhere Object Recorder to manage and execute Windows controls as a background process. 8. Automate routine backups and file management tasks. Why should I learn Automation Anywhere? 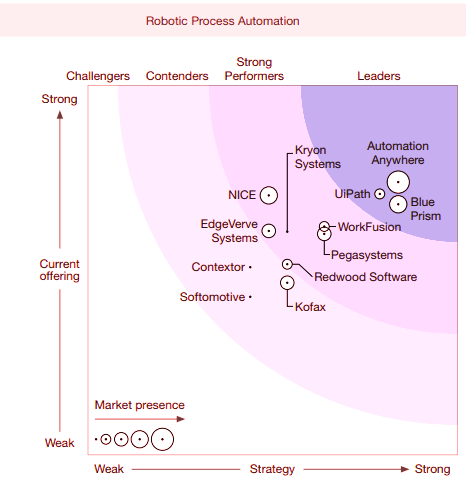 The market for RPA is growing rapidly. More than 3 Million positions are open by 2019 for automation and robotics manufacturing. Its code free, anyone can learn Automation Anywhere without any coding knowledge. The Automation Anywhere's Advanced RPA Certification Assessment is designed to test your knowledge on Automation Anywhere RPA Platform. You will need to dedicate 40 minutes to complete this assessment in a single session. A minimum of 70% is required to pass this assessment. In the event of a failure, you will have to re-appear for Certification at a later date. Recommended that the learner goes through the classroom training before taking up the certification exam. Learn the basics of RPA and get an overview of Automation Anywhere’s RPA tool for creating software robots (bots). Jumpstart a career in RPA with this self-paced training course that flexibly fits any schedule, and can be completed from anywhere. Learn how bots are already helping businesses today. Discover how to identify processes that make good candidates for automation. This self-paced course also provides an overview of Automation Anywhere’s RPA platform, architecture, and components. Estimated time: 5 Hours Learn the basics of the AA Enterprise RPA product. Get prepared to automate processes by learning the essential commands, its features and its functions. Learn how to automate using basic commands and Discover the different components that are necessary to build any automation. Get an overview of Automation Anywhere's Digital Workforce platform to automate a business process. Discover the interesting ways how automation has helped revolutionize the business processes in various industries. This course equips you with the necessary steps on how to automate a simple end-to-end process. At the end of the course, you will get an opportunity to automate a process and build your first bot through guided simulation. Get prepared to learn how AA's industry leading intelligent Bot, IQ Bot, automates complex business processes that relay on data that requires continuous human intervention, and how it is bridging the gap between traditional RPA and full-blown AI technologies. Learn what an IQ Bot is and how it works, with the help of use-cases, through this course. It also presents the benefits of implementing IQ Bot in your environment and the steps to successfully implement an IQ Bot. Get prepared for a continuously operational infrastructure of bots with High Availability in the event of great demand. This course explains how to choose a solution that will protect bots with the right high availability infrastructure. This also explains how to set up Control Room for a selected High Availability and load balancing structure. Gear up yourselves for an uninvited interruption during bots in business. This course helps in business continuity with Disaster Recovery techniques. In an event of catastrophic interruption of business processes due to a disaster, this course helps you to learn the techniques to maintain or quickly resume mission-critical business processes/functions following a disaster. Learn how AA's SAP Automation addresses today's challenge of integrating different SAP ERP systems to automate SAP business processes. AA's SAP Automation offers loads of benefits and provides not one, but three ways to automate SAP processes. Understand the fundamental concept and the application of each method through this course. This course also presents step-by-step instructions to perform each method through simulation. At the end of each method, you will get an opportunity to practice the steps through a guided simulation. Learn how to leverage Digital Workforce within Businesses aspiring/transforming enterprises. Interest in automation specifically RPA to drive value delivery, ramp up of service offerings with focus on developing RPA competency, continuous improvement of capability and RPA thought leadership. This course will help you choose the right CoE Operating model, its functional team structure, and their roles and responsibilities within CoE. It also explains the concept of CoE support in RPA adoption lifecycle and how-to start-up and formalize CoE rapidly in a short span of time. Get prepared to learn how to use the five stages of Process Maturity Model or PMM to identify processes that make good candidates for automation. This course provides the key role the Business Analysts play in all the five stages of the Process Maturity Model, PMM to guide the automation approach. This self-paced training course will teach the right methodology used at various stages of Business Analysis with the set of tools which helps in decision making. This track teaches developers how to understand business requirements, identify RPA opportunities, manage project scope and develop and deploy automations using Automation Anywhere Enterprise built-in commands to provide quick turnaround to business requirements. 1. You are able to describe the work. This doesn’t mean your documentation exists or is current. The task could be described by recording a user performing their work on a computer including how they handle exceptions. 2. The work is rules-based rather than subjective. Robots need to be prepared (aka, taught, trained, configured) to perform specific actions on your systems. While getting closer each year, current technology is insufficient for a robot to determine on its own what to when faced with a new situation. 3. The work is performed electronically. It doesn’t matter how many different applications are required or whether they are in-house, cloud-based, Citrix, desktop or mainframe. 4. The required data is structured (could be structured). If not, you may be able to utilize an OCR and/or cognitive application capable of structuring the file. Alternatively, you could have people enter the data into a structured format. There are many factors that influence the CBA for robotics automation. For example, are you standing up your first automation or are you at scale and adding another automation? Generally, it's hard for slow-moving organizations to make a great case as they are unable to generate enough value to offset financial entry costs. However, a hard-driving organization with scale should expect to save 50-80% of onshore costs and save 25-40% of offshore. Our solutions offering helps organizations achieve comparable value. 1. Robotics COE (below) is the governing body within the organization with representatives from the business and technology as well as its own dedicated resources for benefits realization tracking, scheduling, methods and standards, and prioritization. The Design Authority role which has final say on automation design and configuration delivery quality would sit in the COE. 2. Configuration teams comprised of robotics developers, process analysts, architects and quality control. A rapidly scaling organization would have its own teams and would often contract additional third-party teams. In addition to robotics expertise, configuration team members are often highly proficient with common tools/skills like spreadsheets, formulae, workflows, and macros. 4. Control room team (which may be part of BAU team) schedules robot resources, sets and resets priorities for processing and engages with the operations on the performance of the robots, including identifying potential functionality enhancements for additional value. Our 100% live training sessions can transform your career into a Rewarding Experience! Unlock New Career Opportunities! Automate Routine Operations Across Your Entire Organisation Saving Time and Resources. Eliminate Cost - Enhance Productivity - Power Innovation - Global Training and Support. 24/7 Support. Automation technology to leading financial, insurance, healthcare, technology, manufacturing, telecom and logistics Services.